How children and teens relate to others is important for their social development and mental health. 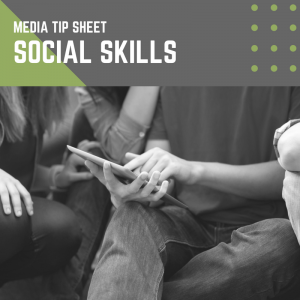 This tip sheet will help you understand how media can teach both positive and negative social skills. Use this information as a guide to help you choose media that are best for your child. What do we mean by media? TV. Movies. Videos. Internet. Social Media. Music. Video Games. Books. Apps. When children and teens see heroes using violence, they learn to use force and bullying to solve problems or arguments. Media violence can make children less sensitive to seeing and hearing about violent acts, and less likely to speak up or seek help when they happen in the real world. Some TV shows, movies, and other media with positive messages can teach kids to be kind, cooperative, understanding, and helpful, whereas violent media can encourage aggression and fear of others. Choose media that show positive ways of solving problems and contain messages about listening, expressing feelings, working together, and being kind. Limit exposure to media violence by viewing the media ahead of time, or reading reviews and watching trailers. Talk to them about what they see and hear in media when it comes to problem solving, and how they talk to and treat their own friends. REMEMBER: Media are not the problem—it is how we use them that results in help or harm. Mindful and focused use can be healthy for kids and teens.